Sir David Frost was a journalist, writer, comedian even gameshow host but probably he gained most fame as an interviewer and TV programme presenter. His TV career began in earnest as the host of That Was The Week That Was, a satirical current affairs programme in the 1960s. He certainly reached the very top of his particular tree. Frost’s chart contains four planets in the 10th house of career including the Sun but also Jupiter which is exactly conjunct the midheaven an aspect that always points to someone who is likely to gain great achievement within their chosen career. Frost had the Sun in assertive Aries and the Moon in penetrative Scorpio, a perfect combination for the figure that burst onto the scenes with the groundbreaking satirical show, TW3, that ruffled the feathers of the Conservative establishment. The programme was irreverent and hard-hitting and Frost was the perfect front man with his Aries / Scorpio combination. David Frost was not a typical Aries however as he had the Sun in conjunction with Saturn which always has a restraining effect. For most of us the Saturn return age 29 to 30 is a time when some of the rebelliousness of youth softens as we face up to a growing need to settle and conform. 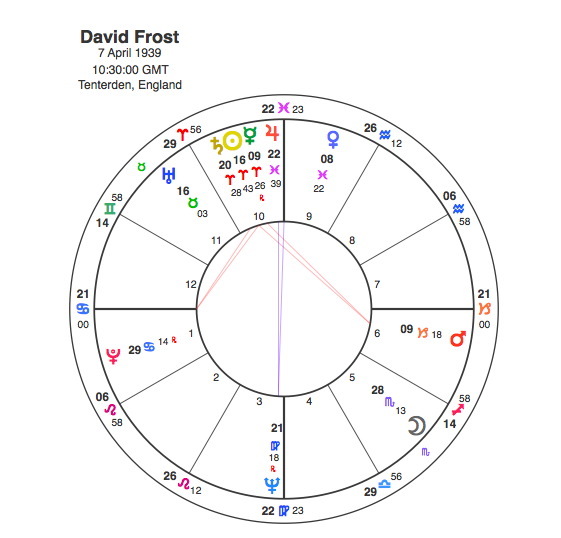 This was particularly the case for Frost as he had Saturn conjunct the Sun in his birthchart. Many people were surprised how easily he was able to discard the antiestablishment image that had propelled his career up to the end of the 60s but this was what Saturn required. The 70s saw him become more of an all round TV host and personality particularly specialising in interviews. The restraining influence of Saturn did not mean that Frost lost any of his Arian clarity. The probing, penetrating Scorpio Moon is most adept at getting to the bottom of things and is perhaps more able than any other placing to get other people to reveal their secret motivations. David Frost’s Cancer rising gave him sensitivity and the ability to empathise with other people. It was this Aries / Scorpio / Cancer combination that made him such a great interviewer and this was clearly seen in his programmes with Richard Nixon in 1977 when he created an opportunity for Nixon to apologise in public for the first time for the Watergate affair. For David Frost, as with most people, Pluto was the planet that triggered the major turning points in his life. For anyone with an Aries Sun in the 20th century Pluto’s transits would be mostly oppositions. Pluto was opposite his Venus in 1962 when he began as host of TW3. It then moved to oppose his Jupiter and Midheaven from 1967- 69 which saw The Frost Report with John Cleese, Ronnie Barker and Ronnie Corbett, it also saw his first breakthrough into American TV and his membership of the consortium that bid for the ITV franchise London Weekend Television in 1968. Probably the peak of his career was the interviews that he did with Nixon 1977, this established him as a eminent global figure in TV. He went on to do the last interview with the Shah of Iran in 1979. Pluto was opposite his Sun from 1977 to 79 and this was undoubtedly the watershed period of his life. David Frost died in August 31, 2013 with Pluto conjunct his Mars in Capricorn. Frost was instrumental in providing a new outlook for a generation and fresh insights into the motivations of politicians. His Aries / Scorpio / Cancer skillset will be sorely missed.